Donations can also be made to The ALS Association, MN/ND/SD Chapter through other Federated Campaigns, other workplace giving options and the United Way’s donor option program. Workplace Giving is an easy way to support The ALS Association MN/ND/SD Chapter. Your gift supports patient service programs and nearly 80 research projects throughout the world. Giving at work through payroll deductions is simple and there are many convenient ways to contribute. 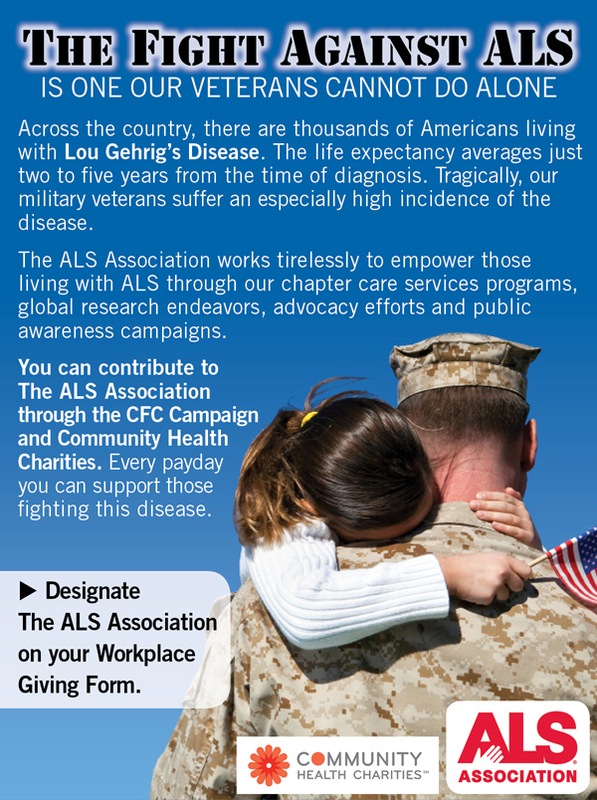 Federal and state employees and members of the military are encouraged to participate in the CFC and may designate The ALS Association Minnesota/North Dakota/South Dakota Chapter by writing The ALS Association - Minnesota/North Dakota/South Dakota Chapter on the Workplace Giving Form. Community Health Charities is the leading workplace giving organization whose mission is to improve lives affected by chronic illness. It is comprised of voluntary health-care organizations, including The ALS Association, MN/ND/SD Chapter. Workplace giving programs such as this have proven to be successful in raising funds, awareness, recruiting volunteers and identifying those living with ALS. Community Health Charities Minnesota helps to fund our Chapter programs, services, and research efforts. You can designate all or part of your gift to The ALS Association, MN/ND/SD Chapter. Donations can also be made to The ALS Association, MN/ND/SD Chapter through other Federated Campaigns, other workplace giving options and the United Way's donor choice program. Even if your company isn't listed here, check with your Human Resources Department to see if you have a Matching Gifts Program. If you do, you will be given a form to complete. After you complete the form, send it to: The ALS Association, MN/ND/SD Chapter, 333 North Washington Ave, Suite 105, Mpls, MN 55401 or fax it to: 612-672-9110.